Since last summer I’ve been making a Zotero entry whenever I see Sci-Hub or Library Genesis mentioned on a blog or in the news, which until recently was a fairly rare occurrence. TorrentFreak, of course, has been covering the publishers’ civil suit since the beginning and was out in front on both Elbakyan’s letter to Judge Sweet in September and the preliminary injunction that followed. The Association of American Publishers, for its part, issued a statement against the sites in October. Then the custodians.online solidarity letter went up in late November, circulating steadily for a couple months on Twitter, Reddit, Hacker News, etc. Finally, February 9 articles by Waddell in The Atlantic and Oxenham on Neurobonkers broke through, kicking off a wave of coverage in the big-time media as well as further discussion on Twitter and many, many posts on academic/library/open access blogs. Since that outpouring I’ve noted just about everything I’ve seen, most of it from various social media feeds. I didn’t search for every last piece, so feel free to comment with anything I’ve missed. There’s good scholarly work on these issues — Cabanac 2016, e.g. — but this set mostly leaves out formal academic sources. At some point I’d like to put together a bib on a broader set of topics: copyright, copyright reform, OA, guerrilla OA, A2K, file sharing, book history and so on — one day. If you’re interested in such things, you can see my condensed reading list here. This bibliography is also posted as a PDF, for those so inclined. Edit 3/22: Corrected a couple typos and added some references I’d missed. a female Faust. “Defiant, Sci-Hub Continues To Provide Full Public Access To Almost 50 Million Scientific Papers Despite Court Order, Causing Uncontrollable Grinning In People Like Me.” Ah, Mephistophelis., February 24, 2016. http://femalefaust.blogspot.com/2016/02/defiant-sci-hub-continues-to-provide.html. Association of American Publishers. “Statement on Libgen/Sci-Hub Complaint,” October 22, 2015. http://publishers.org/news/statement-libgensci-hub-complaint/. Banks, Marcus. “‘Wallets with a Serious Case of Stockholm Syndrome’: Sci-Hub and the Future of Scholarly Communication.” Medium, February 29, 2016. https://medium.com/@marcusbanks/wallets-with-a-serious-case-of-stockholm-syndrome-sci-hub-and-the-future-of-scholarly-29282b31538/. Barok, Dušan, Josephine Berry, Bodó Balázs, Sean Dockray, Kenneth Goldsmith, Anthony Iles, Lawrence Liang, Sebastian Lütgert, Pauline van Mourik Broekman, Marcell Mars, spideralex, Tomislav Medak, Dubravka Sekulić, and Femke Snelting. “In Solidarity with Library Genesis and Sci-Hub.” custodians.online, November 30, 2015. http://custodians.online. Belluz, Julia. “Meet Alexandra Elbakyan, the Researcher Who’s Breaking the Law to Make Science Free for All.” Vox, February 18, 2016. http://www.vox.com/2016/2/18/11047052/alexandra-elbakyan-interview/. Benítez, Santiago. “La Mayor Biblioteca Científica Del Mundo Es Libre Y Se Llama Sci-Hub.” La Izquierda Diario. March 19, 2016. http://www.laizquierdadiario.com/La-mayor-biblioteca-cientifica-del-mundo-es-libre-y-se-llama-Sci-Hub. Bodó, Balázs. “In the Name of Humanity.” Limn, no. 6 (March 2016). http://limn.it/in-the-name-of-humanity/. Bonik, Andreas Schale Manuel. “E-Book Piracy: Interview with Alexandra Elbakyan from Sci-Hub.” Tarnkappe.info, December 23, 2015. https://tarnkappe.info/e-book-piracy-interview-with-alexandra-elbakyan-from-sci-hub/. Brembs, Björn. “Sci-Hub as Necessary, Effective Civil Disobedience.” björn.brembs.blog, February 25, 2016. http://bjoern.brembs.net/2016/02/sci-hub-as-necessary-effective-civil-disobedience/. Buliga, Marius. “Sci-Hub Is Not Tiny, nor Special Interest.” Chorasimilarity, February 18, 2016. https://chorasimilarity.wordpress.com/2016/02/18/sci-hub-is-not-tiny-nor-special-interest/. Cabanac, Guillaume. “Bibliogifts : les bibliothèques clandestines de l’IST.” Archives Ouverts, October 14, 2015. https://openarchiv.hypotheses.org/2932. Caldera Publishing Solutions. “Could Piracy Accelerate Consolidation?” Caldera Publishing Solutions, February 23, 2016. http://www.caldera-publishing.com/blog/2016/2/20/feeling-ripped-off-you-should/. Carbonieri, Fernando. “Sci-Hub, O The Pirate Bay Da Ciência.” LinkedIn Pulse, March 22, 2016. https://www.linkedin.com/pulse/sci-hub-o-pirate-bay-da-ci%C3%AAncia-fernando-carbonieri. Carson, Kevin. “Aaron Swartz Is Dead: But Not His Work.” Augusta Free Press, February 17, 2016. http://augustafreepress.com/aaron-swartz-is-dead-but-not-his-work/. Cochran, Angela. “A Funny Thing Happened on the Way to OA.” The Scholarly Kitchen, February 25, 2016. http://scholarlykitchen.sspnet.org/2016/02/25/a-funny-thing-happened-on-the-way-to-oa/. Cohen, Philip, and Syed Ali. “Academic Hack Heard Round the World.” Contexts, February 16, 2016. https://contexts.org/blog/academic-hack-heard-round-the-world/. Cohen, Philip N. “How to Steal 50 Million Paywalled Papers.” Family Inequality, February 15, 2016. https://familyinequality.wordpress.com/2016/02/15/how-to-steal-50-million-paywalled-papers/. Corneliussen, Steven T. “New York Times Commentary Argues That All Research Papers Should Be Free.” Physics Today, March 14, 2016. http://scitation.aip.org/content/aip/magazine/physicstoday/news/10.1063/PT.5.8169. Crew, Bec. “8 Awesome Science Resources That You Can Access for Free Online.” ScienceAlert, March 11, 2016. http://www.sciencealert.com/8-awesome-science-resources-that-you-can-access-online-for-free. De Giuli, Matteo. “Il Costo Della Conoscenza.” Radio3scienza. RAI Radio 3, March 2, 2016. http://www.radio3.rai.it/dl/portaleRadio/media/ContentItem-0d16d4eb-32aa-47f7-8a20-8a250b8a2e17.html. Dirnagl, Uli. “SCI-HUB: The Beginning of the End of Publishing as We Know It?” To Infinity, and Beyond!, February 25, 2016. https://dirnagl.com/2016/02/25/sci-hub-the-beginning-of-the-end-of-publishing-as-we-know-it/. Doctor, Rina Marie. “Neuroscientist Sets Up Website To Offer Millions Of Academic Papers For Free.” Tech Times, February 16, 2016. http://www.techtimes.com/articles/133862/20160216/neuroscientist-sets-up-website-to-offer-millions-of-academic-papers-for-free.htm. Dupuis, John. “The Sci-Hub Story so Far: Main Event or Sideshow?” Confessions of a Science Librarian, February 22, 2016. http://scienceblogs.com/confessions/2016/02/22/the-sci-hub-story-so-far-main-event-or-sideshow/. Dylla, Frederick H. “No Need for Researchers to Break the Law to Access Scientific Publications.” Physics Today, March 21, 2016. http://scitation.aip.org/content/aip/magazine/physicstoday/news/10.1063/PT.5.2031. Elbakyan, Alexandra. “Sci-Hub Is a Goal, Changing the System Is a Method.” Engineuring, March 11, 2016. https://engineuring.wordpress.com/2016/03/11/sci-hub-is-a-goal-changing-the-system-is-a-method/. ———. “Why Sci-Hub Is the True Solution for Open Access: Reply to Criticism.” Engineuring, February 24, 2016. https://engineuring.wordpress.com/2016/02/24/why-sci-hub-is-the-true-solution-for-open-access-reply-to-criticism/. Esposito, Joseph. “Sci-Hub and the Four Horsemen of the Internet.” The Scholarly Kitchen, March 2, 2016. http://scholarlykitchen.sspnet.org/2016/03/02/sci-hub-and-the-four-horsemen-of-the-internet/. “EXCLUSIVE: Robin Hood Neuroscientist behind Sci-Hub Research-Pirate Site Talks to RT.” RT News, February 14, 2016. https://www.rt.com/news/332412-scihub-scientific-articles-pirate/. Fenwick, Cody. “Why a New Website is Hosting 47 Million Pirated Articles.” Patch, February 19, 2016. http://patch.com/us/across-america/why-new-website-hosting-47-million-pirated-articles-0. Ferlazzo, Larry. “The Best Commentaries On Sci-Hub, The Tool Providing Access to 50 Million Academic Papers For Free.” Larry Ferlazzo’s Websites of the Day…, February 14, 2016. http://larryferlazzo.edublogs.org/2016/02/14/its-now-possible-to-access-47-million-academic-papers-for-free-but-should-we/. “File Sharing and the Open Access Debate.” GenomeWeb, March 14, 2016. https://www.genomeweb.com/scan/file-sharing-and-open-access-debate. Fister, Barbara. “The Fix Isn’t In.” Inside Higher Ed: Library Babel Fish, March 3, 2016. https://www.insidehighered.com/blogs/library-babel-fish/fix-isnt. “Future of Science is Being Decided in Aleppo, Syria.” Homolog.us – Bioinformatics, February 12, 2016. http://www.homolog.us/blogs/blog/2016/02/12/future-of-science-is-being-decided-in-aleppo-syria/. Glance, David. “Elsevier Acts Against Research Article Pirate Sites and Claims Irreparable Harm.” IFLScience, June 16, 2015. http://www.iflscience.com/editors-blog/elsevier-acts-against-research-article-pirate-sites-and-claims-irreparable-harm. Graf, Klaus. “Debatte über Sci-Hub.” Archivalia. March 1, 2016. http://archivalia.hypotheses.org/54820. ———. “Mehr zu Sci Hub.” Archivalia, March 19, 2016. https://archivalia.hypotheses.org/55291. Harle, Jonathan. “High Prices to Access Scholarly Research Could Drive Developing Country Researchers to Use Pirate Sites like SciHub.” Impact of Social Sciences, February 26, 2016. http://blogs.lse.ac.uk/impactofsocialsciences/2016/02/26/high-prices-scholarly-research-developing-country-researchers-scihub/. Harmon, Elliot. “What If Elsevier and Researchers Quit Playing Hide-and-Seek?” Electronic Frontier Foundation, December 16, 2015. https://www.eff.org/deeplinks/2015/12/what-if-elsevier-and-researchers-quit-playing-hide-and-seek. Hartgerink, Chris H.J. “Wiley Also Stopped Me Doing My Research.” Chris H.J. Hartgerink’s Notebook, February 15, 2016. http://onsnetwork.org/chartgerink/2016/02/23/wiley-also-stopped-my-doing-my-research/. Henderson, Emma. “Pirate Website Offering Millions of Academic Papers for Free Refuses to Close despite Lawsuit.” The Independent, February 15, 2016. http://www.independent.co.uk/news/science/pirate-website-offering-millions-of-academic-papers-for-free-refuses-to-close-despite-law-suit-a6875001.html. Hotchkiss, Gord. “The Collateral Damage of Disruption.” MediaPost: OnlineSPIN, March 1, 2016. http://www.mediapost.com/publications/article/270199/the-collateral-damage-of-disruption.html. ———. “The Face of Disruption.” MediaPost: OnlineSPIN. February 23, 2016. http://www.mediapost.com/publications/article/269637/the-face-of-disruption.html. “http://www.sci-hub.io – an end to copyright?” ISOwatch. February 22, 2016. https://isowatch.wordpress.com/2016/02/22/httpwww-sci-hub-io-an-end-to-copyright/. Hydock, Jim. “Sci-Hub: A Pressure Point for Scholarly Publishing.” Text. Outsell, Inc., March 22, 2016. https://www.outsellinc.com/search/d7entity/51157. “Is Piracy of Journals Wrong?” Laboratory News, March 7, 2016. http://www.labnews.co.uk/comment/piracy-journals-wrong-07-03-2016/. Joseph, Heather. Expensive Journals Drive Academics To Break Copyright Law : NPR. Interview by Linda Wertheimer. Radio, February 20, 2016. http://www.npr.org/2016/02/20/467468361/expensive-journals-drive-academics-to-break-copyright-law. Kennerly, Max. “The Jurisdiction Problem in Elsevier’s Lawsuit Against Sci-Hub.” Litigation & Trial Lawyer Blog, February 14, 2016. http://www.litigationandtrial.com/2016/02/articles/attorney/elsevier-vs-sci-hub/. Kossoff, Jonathan. “Pirate Science.” Anatomy of Science, February 21, 2016. http://anatomyofscience.tumblr.com/post/139741153608/pirate-science. Larousserie, David. “Les bibliothèques clandestines de l’édition scientifique.” Le Monde. April 20, 2015. http://www.lemonde.fr/sciences/article/2015/04/20/les-bibliotheques-clandestines-de-l-edition-scientifique_4619506_1650684.html. Levski123. “Sci-Hub, a Pirate Bay for Scientific Literature. Should, Could, Why Hasn’t the Scientific Community Backed This Movement Effort?” Reddit: AskScienceDiscussion, February 14, 2016. https://www.reddit.com/r/AskScienceDiscussion/comments/45ocus/scihub_a_pirate_bay_for_scientific_literature/t1_czzz7nu. Libraria, Gavia. “Next Moves in the Sci-Hub Game.” Gavia Libraria (the Library Loon), February 15, 2016. http://gavialib.com/2016/02/next-moves-in-the-sci-hub-game/. ———. “Playing Whack-a-Sci-Hub.” Gavia Libraria (the Library Loon), February 18, 2016. http://gavialib.com/2016/02/playing-whack-a-sci-hub/. ———. “The Academic-Library Climate around Sci-Hub.” Gavia Libraria (the Library Loon), March 6, 2016. http://gavialib.com/2016/03/the-academic-library-climate-around-sci-hub/. Lopes, Lara. “Sci-Hub Defies Justice by Providing 48 Million Scientific Papers Online for Free.” Interesting Engineering, February 24, 2016. http://linkis.com/interestingengineering.com/UHPjQ. Lowe, Derek. “Thoughts on Sci-Hub.” In the Pipeline, February 16, 2016. http://blogs.sciencemag.org/pipeline/archives/2016/02/16/thoughts-on-sci-hub. ———. “Why SciHub Might Not Matter.” In the Pipeline, March 1, 2016. http://blogs.sciencemag.org/pipeline/archives/2016/03/01/why-scihub-might-not-matter. Lyman, Stewart. “Why Sci-Hub Won’t Lead to the Downfall of Science Publishers.” Lyman BioPharma Consulting LLC. February 27, 2016. http://www.lymanbiopharma.com/blog/files/Why-Sci-Hub-Wont-Lead-to-the-Downfall-of-Science-Publishers.html. MacDonald, Fiona. “Researcher Illegally Shares Millions of Science Papers Free Online to Spread Knowledge.” ScienceAlert, February 12, 2016. http://www.sciencealert.com/this-woman-has-illegally-uploaded-millions-of-journal-articles-in-an-attempt-to-open-up-science. Masnick, Mike. “Using Copyright to Shut Down ‘The Pirate Bay’ of Scientific Research is 100% Against the Purpose of Copyright.” Techdirt, February 17, 2016. https://www.techdirt.com/articles/20160214/15013133603/using-copyright-to-shut-down-pirate-bay-scientific-research-is-100-against-purpose-copyright.shtml. McCarthy, Kieren. “Free Science Journal Library Gains Notoriety, Lands Injunctions.” The Register, February 12, 2016. http://www.theregister.co.uk/2016/02/12/science_journal_dump_lands_injunctions/. Mirkinson, Jack. “The Price of Freedom: This Woman Is Sharing Millions of Research Papers Online—and Making Some Major Enemies.” Fusion, February 13, 2016. http://fusion.net/story/268775/scihub-alexandra-elbakyan-research-publishing/. Moody, Glyn. “As Predicted, Elsevier’s Attempt To Silence Sci-Hub Has Increased Public Awareness Massively.” Techdirt, March 18, 2016. https://www.techdirt.com/articles/20160316/10375733922/as-predicted-elseviers-attempt-to-silence-sci-hub-has-increased-public-awareness-massively.shtml. Murphy, Kate. “Should All Research Papers Be Free?” The New York Times, March 12, 2016. http://www.nytimes.com/2016/03/13/opinion/sunday/should-all-research-papers-be-free.html. Myers, Paul Zachary. “Alexandra Elbakyan is My Hero.” Free Thought Blogs, February 12, 2016. http://freethoughtblogs.com/pharyngula/2016/02/12/alexandra-elbakyan-is-my-hero/. NewsGram News Desk. “Court yet to Decide, Sci-Hub Stays or Not.” NewsGram, February 13, 2016. http://www.newsgram.com/court-yet-to-decide-sci-hub-stays-or-not/. Northern Light. “There’s No Place for ‘Robin Hood’ in Science Research Publishing,” February 25, 2016. https://northernlight.com/wp-content/uploads/2016/02/No-place-for-Robin-Hood-in-science-research-publishing-FINAL-2.25.16.pdf. North, Gary. “Goodbye, Copyright. Farewell, Tenured Guilds.” Gary North’s Specific Answers, February 15, 2016. http://www.garynorth.com/public/14859.cfm. North, Irene. “Limiting Knowledge Is a Detriment to Society.” Scottsbluff Star Herald. March 16, 2016. http://www.starherald.com/opinion/north-limiting-knowledge-is-a-detriment-to-society/article_734a62ce-ebf7-11e5-a913-6395dac51a0b.html. Oswald, Ed. “Sci Hub Says Commercial Research Journals Are Ruining Science.” Digital Trends, February 17, 2016. http://www.digitaltrends.com/cool-tech/sci-hub-research-piracy/. Oxenham, Simon. “Meet the Robin Hood of Science.” Neurobonkers, February 9, 2016. http://bigthink.com/neurobonkers/a-pirate-bay-for-science. ———. “The Academic Publishing Scandal in Two Minutes.” Neurobonkers, March 3, 2016. http://bigthink.com/neurobonkers/the-academic-publishing-scandal-in-two-minutes. ———. “The Robin Hood of Science: The Missing Chapter.” Neurobonkers, February 15, 2016. http://bigthink.com/neurobonkers/the-robin-hood-of-science-the-missing-chapter. Priego, Ernesto. “Signal, Not Solution: Notes on Why Sci-Hub Is Not Opening Access.” The Winnower, February 23, 2016. https://thewinnower.com/papers/3489-signal-not-solution-notes-on-why-sci-hub-will-not-open-access. Regier, Ryan. “Scholarly Piracy: And What Libraries Could/Should Be Doing about It.” A Way of Happening, February 25, 2016. https://awayofhappening.wordpress.com/2016/02/25/scholarly-piracy-and-what-libraries-couldshould-be-doing-about-it/. Resnick, Brian. “Why One Woman Stole 47 Million Academic Papers — and Made Them All Free to Read.” Vox, February 17, 2016. http://www.vox.com/2016/2/17/11024334/sci-hub-free-academic-papers. Reznik-Zellen, Rebecca. “What Sci-Hub Does Not Do.” LSL Now: News and Events of The Lamar Soutter Library, March 16, 2016. http://library.umassmed.edu/lsl_now/what-scihub-does-not-do. Rosenthal, David. “Elsevier and the Streisand Effect.” DSHR’s Blog, March 15, 2016. http://blog.dshr.org/2016/03/elsevier-and-streisand-effect.html. Ruff, Corinne. “Librarians Find Themselves Caught Between Journal Pirates and Publishers.” The Chronicle of Higher Education, February 18, 2016. http://chronicle.com/article/Librarians-Find-Themselves/235353. Ruptly TV. “Russia: Meet the ‘Robin Hood of Science’ — Sci-Hub’s Alexandra Elbakyan.” RT: Ruptly TV, February 20, 2016. https://www.youtube.com/watch?v=w8p-B_u7GiU. Russell, Carrie, and Ed Sanchez. “Sci-Hub Unmasked: Piracy, Information Policy, and Your Library.” College & Research Libraries News 77, no. 3 (March 1, 2016): 122–25. http://crln.acrl.org/content/77/3/122. Russon, Mary-Ann. “Sci-Hub: Russian Neuroscientist Running ‘Pirate Bay for Scientists’ with 48 Million Free Academic Papers.” International Business Times UK, February 15, 2016. http://www.ibtimes.co.uk/sci-hub-russian-neuroscientist-running-pirate-bay-scientists-48-million-free-academic-papers-1543926. Salmon, Felix, Cathy O’Neil, and Jordan Weissmann. The Breaking the Law Edition: Slate Money with Guan Yang on Apple and the FBI, Sci-Hub, and Argentina. MP3. Slate Money. February 26, 2016. http://www.slate.com/articles/podcasts/slate_money/2016/02/slate_money_on_apple_and_the_fbi_sci_hub_and_argentina.html. Schiermeier, Quirin. “Pirate Research-Paper Sites Play Hide-and-Seek with Publishers.” Nature News & Comment, December 4, 2015. http://www.nature.com/news/pirate-research-paper-sites-play-hide-and-seek-with-publishers-1.18876. Schonfeld, Roger C. “Meeting Researchers Where They Start: Streamlining Access to Scholarly Resources.” Ithaka S+R, March 26, 2015. http://www.sr.ithaka.org/publications/meeting-researchers-where-they-start-streamlining-access-to-scholarly-resources/. Schughart, Anna. “Die Robin Hood Der Wissenschaft: Alexandra Elbakyan Im WIRED-Interview.” WIRED Germany, February 25, 2016. https://www.wired.de/collection/latest/sci-hub-gruenderin-alexandra-elbakyan-laedt-teure-wissenschaftliche-aufsaetze. “Sci-Hub and the Publication Pirates.” Hello PhD, February 28, 2016. http://hellophd.com/2016/02/34-sci-hub-publication-pirates/. “‘Sci-Hub Is Breaking Laws’ – Argues Chemistry Blogger, Who Himself Is Breaking Laws.” Homolog.us – Bioinformatics, February 22, 2016. http://www.homolog.us/blogs/blog/2016/02/22/sci-hub-is-breaking-laws-argues-chemistry-blogger-who-is-himself-breaking-laws/. “Sci-Hub, Le Pirate Bay de La Recherche Scientifique, Est de Retour.” Le Monde. February 15, 2016. http://www.lemonde.fr/pixels/article/2016/02/15/sci-hub-le-pirate-bay-de-la-recherche-scientifique-est-de-retour_4865611_4408996.html. “Sci-Hub vs. Open Access.” Scholars Cooperative, Wayne State University Blogs, March 15, 2016. http://blogs.wayne.edu/scholarscoop/2016/03/15/sci-hub-vs-open-access/. Searle, Nicola. “The Sci-Hubbub.” The IPKat, March 19, 2016. http://ipkitten.blogspot.com/2016/03/the-sci-hubbub.html. Singer, Marie. “Millions of Academic Papers Offered Free by Russian Scientist Illegally.” Market Business News, February 15, 2016. http://marketbusinessnews.com/millions-of-academic-papers-offered-free-by-russian-scientist/125014. Smith, David. “Sci-Hub: How Does It Work?” The Scholarly Kitchen, February 25, 2016. http://scholarlykitchen.sspnet.org/2016/02/25/sci-hub-how-does-it-work/. Smith, Kevin. “Some Radical Thoughts about Sci-Hub.” Scholarly Communications @ Duke, March 3, 2016. http://blogs.library.duke.edu/scholcomm/2016/03/03/some-radical-thoughts-about-scihub/. Sonnad, Nikhil. “The Website That Offered 47 Million Pirated Academic Papers Is Back.” Quartz, February 14, 2016. http://qz.com/616677/the-website-that-offered-47-million-pirated-academic-papers-is-back/. Steel, Graham. “Some Thoughts about Sci-Hub.” McBlawg, February 18, 2016. https://steelgraham.wordpress.com/2016/02/18/some-some-thoughts-about-sci-hub/. ———. “Some Thoughts about Sci-Hub.” The Winnower, February 18, 2016. https://thewinnower.com/papers/3434-some-thoughts-about-sci-hub/. Straumsheim, Carl. “Study Explores Peer-to-Peer Research Sharing Communities,” March 16, 2016. https://www.insidehighered.com/news/2016/03/16/study-explores-peer-peer-research-sharing-communities. Suber, Peter. “A Few Thoughts on Sci-Hub.” Peter Suber, Google+, March 13, 2016. https://plus.google.com/+PeterSuber/posts/j7vzhVkXG1t/. Taub, Ben. “‘Research Pirate’ Illegally Makes Millions Of Scientific Papers Available For Free.” IFLScience, February 13, 2016. http://www.iflscience.com/editors-blog/research-pirate-makes-millions-scientific-papers-available-free. Taylor, Mike. “Barbra Streisand, Elsevier, and Sci-Hub.” Sauropod Vertebra Picture of the Week, February 17, 2016. http://svpow.com/2016/02/17/barbra-streisand-elsevier-and-sci-hub/. ———. “Does Sci-Hub Phish for Credentials?” Sauropod Vertebra Picture of the Week, February 25, 2016. http://svpow.com/2016/02/25/does-sci-hub-phish-for-credentials/. ———. “Sci-Hub Is a Scholarly Litmus Test.” Sauropod Vertebra Picture of the Week, March 4, 2016. http://svpow.com/2016/03/04/sci-hub-is-a-scholarly-litmus-test/. ———. “Thought-Experiment #1: What Will Happen If Sci-Hub Succeeds?” Sauropod Vertebra Picture of the Week, March 10, 2016. http://svpow.com/2016/03/10/thought-experiment-1-what-will-happen-if-sci-hub-succeeds/. ———. “Thought-Experiment #2: What Will Happen If Sci-Hub Fails?” Sauropod Vertebra Picture of the Week, March 11, 2016. http://svpow.com/2016/03/11/thought-experiment-2-what-will-happen-if-sci-hub-fails/. ———. “What Is Alexandra Elbakyan’s Motivation for Creating and Running Sci-Hub?” Sauropod Vertebra Picture of the Week, February 28, 2016. http://svpow.com/2016/02/28/what-is-alexandra-elbakyans-motivation-for-creating-and-running-sci-hub/. ———. “What Should We Think about Sci-Hub?” Sauropod Vertebra Picture of the Week, February 22, 2016. http://svpow.com/2016/02/22/what-should-we-think-about-sci-hub/. Tenen, Dennis. “Preliminary Thoughts on the Way to the Free Library Congress.” Dennis Tenen, February 17, 2016. http://denten.plaintext.in/think.stack/free-library-congress/. Tennant, Jonathan. “Thoughts on Sci-Hub.” Green Tea and Velociraptors, February 20, 2016. http://fossilsandshit.com/2016/02/20/thoughts-on-sci-hub/. Tzezana, Roey. “Science Just Wants To Be Free.” HuffPost Tech, February 22, 2016. http://www.huffingtonpost.com/wikistrat/science-just-wants-to-be-_b_9278126.html. ———. “Science Just Wants To Be Free.” Curating the Future, February 26, 2016. http://curatingthefuture.com/2016/02/26/science_journals_controversy_copyrights/. Van der Sar, Ernesto. “Court Orders Shutdown of Libgen, Bookfi and Sci-Hub.” TorrentFreak, November 2, 2015. https://torrentfreak.com/court-orders-shutdown-of-libgen-bookfi-and-sci-hub-151102/. ———. “Elsevier Cracks Down on Pirated Scientific Articles.” TorrentFreak, June 9, 2015. https://torrentfreak.com/elsevier-cracks-down-on-pirated-scientific-articles-150609/. ———. 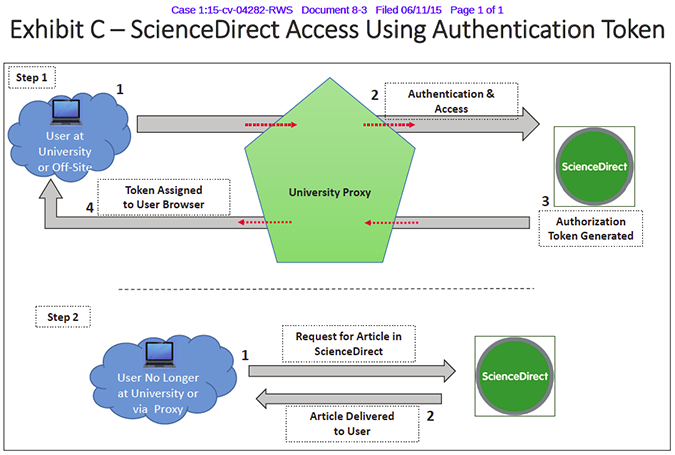 “Science ‘Pirate’ Attacks Elsevier’s Copyright Monopoly in Court.” TorrentFreak, September 16, 2015. https://torrentfreak.com/science-pirate-attacks-elseviers-copyright-monopoly-in-court-150916/. ———. “Sci-Hub, BookFi and LibGen Resurface After Being Shut Down.” TorrentFreak, November 21, 2015. https://torrentfreak.com/sci-hub-and-libgen-resurface-after-being-shut-down-151121/. ———. “Sci-Hub Helps Science ‘Pirates’ to Download 100,000s of Papers Per Day.” TorrentFreak, February 29, 2016. https://torrentfreak.com/sci-hub-helps-science-pirates-to-download-100000s-of-papers-per-day-160229/. ———. “Sci-Hub Tears Down Academia’s ‘Illegal’ Copyright Paywalls.” TorrentFreak, June 27, 2015. https://torrentfreak.com/sci-hub-tears-down-academias-illegal-copyright-paywalls-150627/. Vippero. “Sci-Hub: Russian Neuroscientist Running ‘Pirate Bay for Scientists’ with 48 Million Free Academic Papers : Technology.” Reddit: Technology, February 15, 2016. https://www.reddit.com/r/technology/comments/45wwru/scihub_russian_neuroscientist_running_pirate_bay/. Waddell, Kaveh. “The Research Pirates of the Dark Web.” The Atlantic, February 9, 2016. http://www.theatlantic.com/technology/archive/2016/02/the-research-pirates-of-the-dark-web/461829/. Watson, Mick. “On Preprints, Open Access and Generational Change.” Opiniomics, February 22, 2016. http://www.opiniomics.org/on-preprints-open-access-and-generational-change/. “What If All Research Papers Were Free?” The Brian Lehrer Show, March 15, 2016. http://www.wnyc.org/story/what-if-all-research-papers-were-free/. Willighagen, Egon. “Sci-Hub: A Sign on the Wall, but Not a New Sign.” Chem-Bla-Ics, February 27, 2016. http://chem-bla-ics.blogspot.co.uk/2016/02/sci-hub-sign-on-wall-but-not-new-sign.html. Willinsky, John. “Sci-Hub: Research Piracy and the Public Good.” Times Higher Education, March 14, 2016. https://www.timeshighereducation.com/blog/sci-hub-research-piracy-and-public-good. Hey friends, welcome to my new blog at stephenmclaughlin.net. I plan to use this space to collect recent work toward my PhD in Information Studies, including notes on resources I’ve found helpful and perhaps draft snippets from things I hope to publish. In choosing to share my incremental progress, I’m taking leaves from Kathleen Fitzpatrick’s well-known open peer review approach and Janneke Adema’s use of her blog to develop texts and ideas on the way to the ‘final’ work. Both Fitzpatrick and Adema have called for more open and experimental forms of academic research. Comments are enabled, by the way, so please do respond if something strikes you. You can create an account here. Later today I’ll be posting a collection of legal documents from the ongoing Elsevier Inc. et al. v. Sci-Hub et al. case, followed by a brief bibliography of responses to the lawsuit in blogs and the media.